Animation Mentor has posted a new tutorial from Bobby Beck entitled "Polishing with Bend Bows." Check out Polishing with Bend Bows. Kevan Shorey of DreamWorks has just posted the 4th installment of his Anim Crit series. Just like the 11sec eCritiques they are full of great priceless information. Head over to his blog Rhymes with "Red Van" to watch some great animation breakdowns. Don't forget about the 11sec eCritiques as well. Want to try your hand at stop motion or clay character animation? 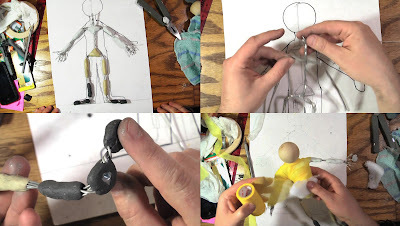 Here is a step-by-step tutorial on how to make a wire armature for around $15. This gets into how to make a puppet that will stand and walk. I’ve taught this process at the Academy of Art, and if there is one consistency, it is that when students are cheap with the materials or stray from the process, things go wrong. A challenge with stop motion animation is to hold to your vision while working within the physical limitations of tight-budgeted productions. Compromise is always necessary. The goal is to make a puppet that is easy to use while animating so your attention can go towards the performance and not the struggle against gravity. iANIMATE has started a new web series of short tutorials and tips for the public. They just posted there second video in there "iANIMATE.NET LAB" series that focuses on blocking. Mike Walling from DreamWorks talks to us about how he focuses on a simplified singular pose before he moves on to adding his offsets and other actions that make your animation stand out. This is very similar to the same way I block. For me I can read my animation better if I look at each pose as its own 2D drawing. Keeping in mind that they need to all work together I build them off each other until I have a series of strong poses working with the 12 principles of animation. This process makes the transition into spline more enjoyable and allows me to spend less time fighting a broken animation and more time making my existing blocking pop. Yes, that's right! A new challenge already! Since the last challenge didn't go too well (or rather, not at all), I thought I might try something considerably simpler. You could have, for example, someone waiting in the train ticket queue since 1 hour and being bored to death, or have someone waiting in line for a ticket to the most exciting rock concert ever, and the impending doom of a sold out show is ever looming above her head. Maybe you have someone waiting for his date to arrive, and all the excitement and novelty of this (first?) encounter makes him completely giddy, nervous and anxious? But you can also go at this from a more games orientated pov, like animating an idle cycle, or the cycle you have after you leave your character standing around for too long? Here would be important to avoid too much and too little movement, and maybe try to stay away from cliche things like scratching the bum or picking the nose. Although, if it fits the character, why not? And, if you're not too comfy with character animation yet, this can also be done sith some simpler objects, like Pixo the lamp, for example! I'd set the deadline to Monday, July 2nd, and as always, try to keep the video length to 75-125 frames, here's the link to how to use the dropbox, please try and keep the videos below 10 MB, and if any more questions arise, Steve did a nice FAQ here.